Hi There, Real Me Is Running An Loot Offer Where You Can Grab Tech Backpack at Just Rs. 1. Limited Stocks, Sale Will Be Live at 11.50 A.M. Hurry !! Stay Tuned !! Nikhil3693 Did someone get it? 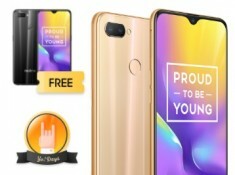 rohit.omguru This deal is just a dummy deal, which goes in 2 secs out of stock.They want users to sign-up for them and share, I believe you should remove this, as this are just false deals,like Honor do.